- 4 foundation piles (right) - build up in suit from Ace to King. - 4 cells (top) - storage locations for cards. Only 1 card allowed in each cell. Only 1 card of each suit is allowed in the cells. First cell holds a Clubs, 2nd a Diamonds, 3rd a Hearts, 4th a Spades. - 7 tableau piles (below cells) - build down by alternate color. Move groups of cards if they are in sequence down by alternate color. 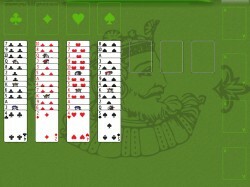 Fill spaces with any card or legal group of cards. At the start of the game 13 cards are dealt to each of the leftmost 4 piles (all cards of the same suit are dealt to the same pile). The remaining 3 piles start the game empty.